If you need to make the paper file as digital file for record, usually we choose to scan the paper file. Then if you would like to sort out the file in some purpose, then it will be a little bit difficult. It will be a heavy job. Then is there an affordable PDF tool to scan the paper file as PDF and split it into small files? No worries. 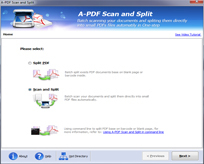 Split PDF on Canon Scanner (A-PDF Scan and Split) is one of the useful and helpful PDF tool to scan your files and split your scanned files in minutes. Let's show you some wonderful features of Split PDF on Canon Scanner. Split PDF on Conon Scanner provides three modes for users to split scanned PDF into multiple pages with ease. Let's start to introduce the powerful PDF tool with batch mode. Split PDF on Canon enable split scanned PDF into multiple pages by blank page on Canon or Brother Scanner easily. Then in batch mode, you are able to select to batch split PDF directly or scan and split the PDF file. It can batch scan your file and then batch split the PDF file in minutes. By the way, you also can use command line to split PDF based on the blank page or other easily. That's useful batch mode. Here you can customize hot directory settings such as monitored directory and then customize output and log file directly. And then it is time to select split method and separator page settings. Then continue to customize applications settings. Anyway, please don't forget to save backup for the PDF file. Finally, continue to start services quickly. Split PDF on Canon Scanner provides three split methods for users to split the scanned file easily. Just select a proper and continue to scan and split. And then prepare for printing barcode page, source selecting and output settings. Finally, click "Start" and start to batch scan and split the PDF file.